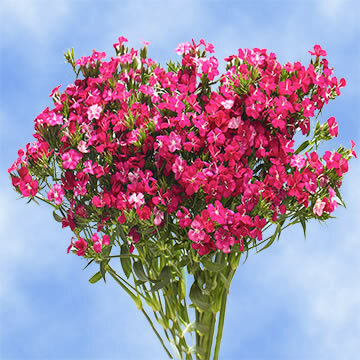 At Global Rose, we provide customers with the best quality Hot Pink Dianthus Flowers at affordable prices. Each bloom comes straight from our own greenhouse and come with double guarantee, so you're guaranteed with only the freshest products with every order. Our Fresh Hot Pink Dianthus Blooms are grown in environmentally-friendly greenhouses in the USA, which means your order is guaranteed to be fresh and beautiful. Your Hot Pink Dianthus Blooms are hand-picked and cut just for you, and will arrive at your door just 4 days after you order. Please know that color tones for all flowers and roses may vary due to the computer monitor and/or Mother Nature.